Ah the joys of baking sweet stuff; and baking for a good cause too. My sisters, mother and I love baking so we’re in the process of getting ready for a coffee morning on 2 November. It’s a fund-raising event for Motor Neurone Disease, as last year my aunt was diagnosed with this awful illness. MND is name for a group of illnesses which cause damage to the nerves called the motor neurones, the nerves that carry messages to the muscles. It can result in difficulties with walking, lifting your arms, chewing or swallowing. It’s also a progressive condition which means the damage gets worse in time and there is no cure at present. Anyway, for our baking morning I’m planning to make one of Nigella Lawson’s chocolate cakes. It’s gluten-free and dairy-free, which makes it sound terribly earnest and “a good for you kind of thing”, but it is absolutely delicious because it’s so chocolate-y and moist. I’ve adapted it slightly according to my own baking experiments. 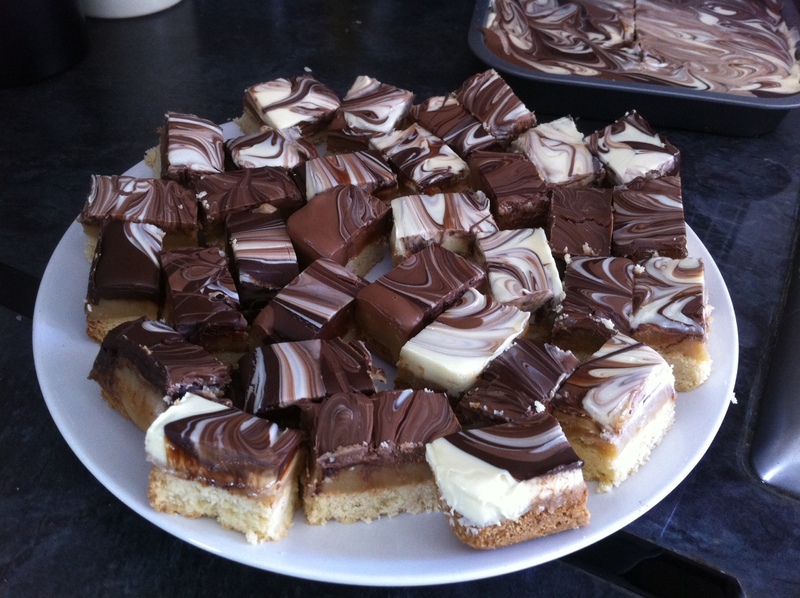 I’m also planning some millionaire’s shortbread with a marbled chocolate topping as most folks love the combination of buttery shortbread, super sweet caramel and the crisp chocolate topping. I was toying with the idea of coconut ice too – retro but pretty, hmm? Pre-heat the oven to 170 degrees C. Grease and line a loose-bottomed square 20cm cake tin. Mix the cocoa powder with the boiling water and whisk until smooth. Leave to cool. Using an electric hand mixer, beat the eggs and sugar together with the vanilla extract for three or four minutes until you have a smooth, pale-yellow coloured mix. Add the eggs and whisk in one by one. Add the cocoa and water and the ground almonds and mix thoroughly (using a wooden spoon to keep the volume the eggs have added). Add the baking powder and mix in. Bake for 40-45 minutes. If you stick in a skewer or a knife it should come out with a few crumbs sticking to it. Turn out, leave to cool and cut into squares. You can serve as a cake dusted with icing sugar just before serving, or serve warmed with a spoonful of sweetened cream or ice-cream. Thanks ever so much Jenny – I’d be obliged if you could (it’s very kind of you). Do you need me to do anything?